Getting there: The trail is located in the city of Hancock and can be accessed from many points. The main trailhead is located at the Houghton County Arena. What's there: The Maasto Hiihto, which means "cross country skiing" in Finnish, is a striding-only trail system that offers kilometer after kilometer of unsurpassed skiing on varied and scenic trails. The trail system connects with the Churning Rapids trails. The two systems contain about 25 kilometers of groomed trails. 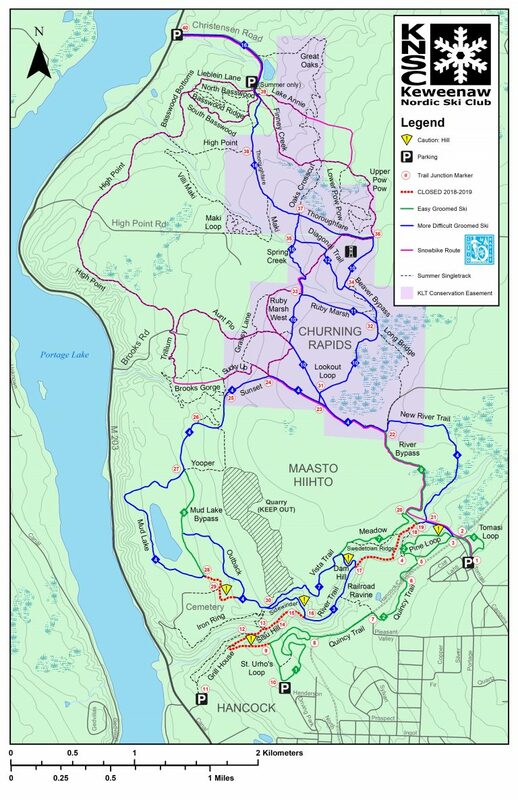 Two trailheads provide access to Maasto Hiihto: one at the Chalet on the Houghton County fairgrounds, and the other at Tomasi Road near the Hancock city garage, North of The Portage Health System. The Houghton County fairgrounds and Chalet site is indicated on the trail map. Churning Rapids provides a true backcountry experience, with striding-only trails accessed from Maasto Hiihto or from a trailhead at Christiansen Road at M-203, North of Hancock. Trails wind through the John Christiansen wildlife preserve. A 15-foot high observation tower provides wonderful views of Lake Superior; a scenic meadow trail leads to the beaver pond, and more trails wind thru the diverse woodlands.